Grange Hill. The Grange was one of the manors originally belonging to Tilty Priory. After the dissolution of the monaster¬ies it was granted in 1537 to Thomas Adlington; it changed hands many times until the manor was given as an endowment to Brentwood Grammar School in 1558. The School retained the property until the late 19th century when the land was sold and the building demolished. The Hill is the road at the front of the station. 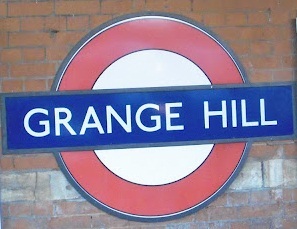 The station was opened as GRANGE HILL by the Great Eastern Railway on 1 May 1903 and was first used by Underground trains on 21 November 1948.